John O'Shea at Bolton last night. Angry Chris Coleman hit out at referee David Coote for his part in the controversial winning goal in last night’s defeat to Bolton Wanderers. Sunderland lost the relegation six-pointer 1-0 to rivals Bolton, Zach Clough scoring in the 17th minute, to further heighten drop fears. Defeat saw Sunderland go bottom, three points from safety with a far inferior goal difference. The goal was awarded despite fierce protests from the Sunderland players that Clough had handled the ball past keeper Lee Camp, who should have done better at his near post. Coleman was furious that Coote didn’t spot the handball and he also was angry that the free-kick from which Bolton scored was given in the first place. Billy Jones was adjudged to have handled on the right flank, with Clough then bundling home Filipe Morais’s set piece. Coleman has hit out at the “indecisive” official, who got the decision “drastically wrong”. 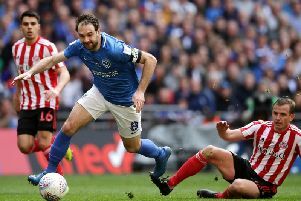 Coleman said: “We get a throw in given to us by the ref, the linesman flags and says no it was handball that Billy Jones picked the ball up on the pitch. He was off the pitch. I have looked at it again. “They take the free-kick and from that there is a handball from one of their players, but the goal is given. “You can’t blame us for being slightly frustrated with decisions like that. I thought he was indecisive all night, which made it edgy. “Then you lose a bit of trust, get a bit nervous. In terms of our performance though, that was a bit more like it. “We did everything but put the ball in the net – that is down to confidence. “We had a good bite and vibe about us. They scored from their first chance – we dictated, really, until half time, started well again but couldn’t get the ball in the net. “The goal, I never make excuses for my team. If we play badly I will say it, but I can’t say we deserved to lose that game. Camp, signed on loan from Cardiff in January, should have more at his near post to stop Clough’s effort from gifting Bolton the lead. When asked whether experienced Camp should have done more, Coleman said: “I wasn’t looking at Campy, I was looking at their guy throwing the arm at the ball. “It is a tough one to comment on that. You saw the reaction from our guys, it was a blatant handball. Coleman made three changes to his side, reverting to three centre-backs, with Paddy McNair restored in central midfield. The Northern Ireland international completed 90 minutes on his return. Coleman added: “It will do him the world of good. He has picked up a few injuries since coming back [from a long-term knee injury], we have held him back and played him in the U23s. Right-back Adam Matthews missed out with a hamstring injury and will be assessed, while on-loan midfielder Ovie Ejaria has a thigh injury. He will be assessed further ahead of the visit of Middlesbrough on Saturday.